Tony Berg pairs ice fishing with massive cocktail making. Published Jan. 27, 2019 at 3:24 p.m. There's a lot of down time when ice fishing, and some fisher folk like to multi-task with drinking, grilling or listening to music. Wauwatosa's Tony Berg, however, decided to give large-scale mixology a whirl while waiting for something to bite. 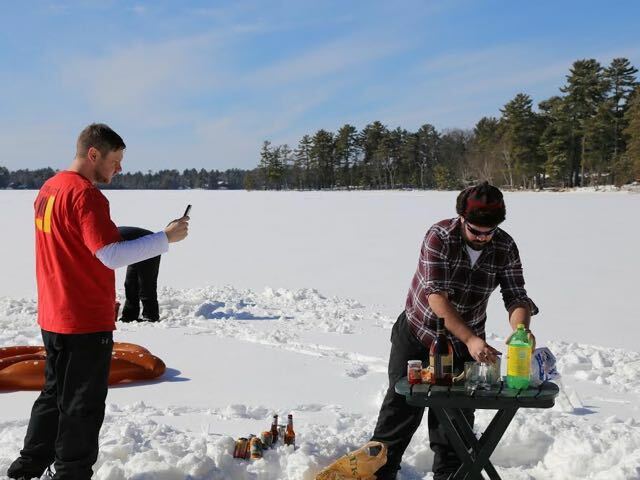 Berg, who spends a weekend every year at a cabin in Three Lakes, decided to concoct "Wisconsin's Largest Old Fashioned" while atop frozen Round Lake. Naturally, a friend documented the experience and voila: this YouTube video. Berg admits it's most likely not the largest Old Fashioned ever made – it's about five times the size of a standard cocktail – but a quick search confirmed there currently is not a Guinness World Record. So maybe it is. "I doubt it holds any legitimate record, but I'll say I have not seen anything larger out there," says Berg. "I'd be happy to go bigger next time." OK, so who's in? Must like Squirt.